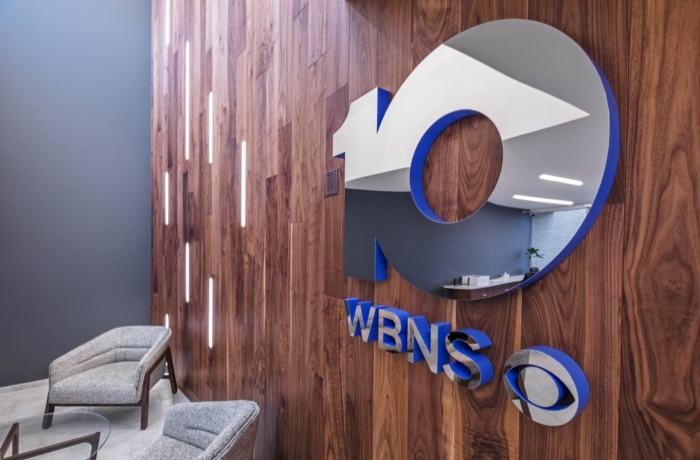 M+A Architects created the office design for popular Ohio news channel WBNS 10TV, located in Columbus, Ohio. The 1948 founding building of central Ohio’s most watched news channel, WBNS-TV, had been added to four times in thirty years, with each addition constructed differently. In 2017, M+A was tasked with the renovation of the building and merging the additions into a cohesive concept. Through extensive code review and detailed survey of the structures’ systems, the team diligently managed to work through this considerable challenge. The scope of work included updating designing the reception area to be open and modern, adjoining previously separate areas of the building, improving restrooms accessibility, increasing natural light, and implementing open floor plan tactics to improve employee communication and collaboration. Bright punches of color now spread across the walls, adorned with story-telling environmental graphics and unexpected design accents including vertical lights, polished steel and unexpected pops of bold color. Custom etched acrylic signs with motion sensor detection come to life when people enter the rooms, energetically lighting up the words “On Air” and “Breaking News”. This renovation was an exercise in creating a dimensional design to honorably reflect a truly illustrious station.